The data for the chart shown above comes from the Alberta Chicken Producer's Annual Report for 2012. They provide some interesting data on the cost of buying chicken quota in the Wild Rose Country. The price of chicken quota has been going up at a consistent rate of 29.5% per year for the last 4 years. That means quota prices double every 2.4 years. Exponential growth is never sustainable. For example, the pressure wave created by a stick of dynamite exploding is an exponential increase; and we know how destructive that can be. It's no different here. It's only a matter of time. More recently, as the Alberta economy has started to tank, the quota pricing has dropped from its peak. Is this the beginning of the end of Supply Management? 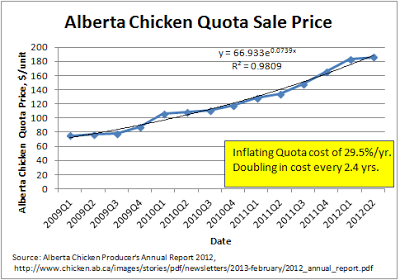 There are 235 quota holding chicken producers in Alberta. They get to produce 3.2 kg of chicken for each unit of quota they hold. As of Dec. 2012, chicken quota was $166.66 per Quota Unit. There is a total of 6.05 Million units of outstanding chicken quota, so that has a total capitalized value of $1 Billion. I wonder why someone would pay that kind of money to be a chicken producer? It must be a very profitable business to attract that kind of entrance fee. Yes, it's quite an investment. Why would someone be willing to pay 30% more each year to become a chicken farmer in Ontario? Obviously, unless somebody stops it from continuing, the price will continue to rise as the economic benefits received by a Quota-based chicken farmer demand or enable these type of price increases. Eventually, the quota price will reach a nose-bleed level of prices that remove all of the benefits; the quota break-even price. At that quota break-even point, the astronomic quota price makes it a 50/50 chance that the quota farmer can pay his bills, or will go bankrupt. This begs the question as to why the SM system must be structured so it is so favorable for the SM chicken farmer? Alternatively, the SM rules could be changed so it is less favorable for the SM chicken farmer. For Canada and its consumers, the best changes that SM could make would be: a) lowering of the farm gate price; and b) SM exercising control of the downstream processing and distribution so that farm gate savings are passed on to consumers. New processing quota could be distributed based upon the weighted average price charged by each processor. Can Supply Management be Saved?